We used a mixture of large golden delicious apples and Granny Smith apples, and five apples were more than enough. 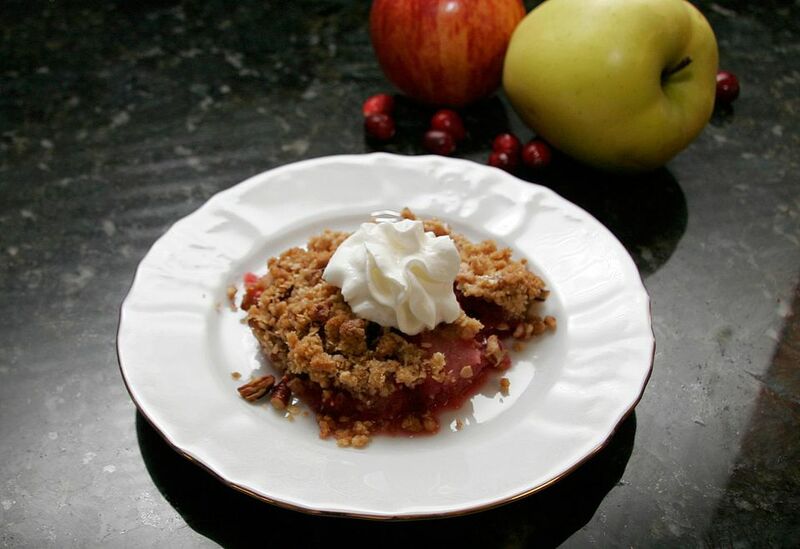 This delicious crisp is the perfect dessert for a crisp fall day. A little ground cinnamon spices the topping, and pecans add crunch. Combine the sliced apples, cranberries, and 2/3 cup of granulated sugar; turn into a lightly buttered 11x7x2-inch baking dish. In a mixing bowl, combine oats, brown sugar, cinnamon, and flour. ​Cut in cold butter until coarse crumbs form. Stir in chopped pecans. Sprinkle the crumb mixture evenly over fruit and press down lightly. Bake for about 30 to 35 minutes, or until topping is browned and fruit is tender and bubbly. Serve with a generous spoonful of whipped cream or a scoop of ice cream.